The inverted skeleton of a house appears to have crash-landed into the pastoral landscape in Rosemary Laing’s new leak series, premiering in the U.S. at Galerie Lelong. Four of the leak photographs have never been seen before, while the rest of the series have not been shown in the United States. The leak series powerfully depicts how suburbanization threatens the idyllic vistas of the Australian landscape. Leak is Laing’s fifth solo exhibition at Galerie Lelong and will open to the public on Thursday, September 6th. The artist will be present at the opening. scene at a disorienting size and vantage point. All three works reference traditional European landscape paintings while disrupting their conventionally harmonious duality between culture and nature. Laing is known for staging these types of interventions in geographically symbolic locations, and writers have often related her process to cinematic production. 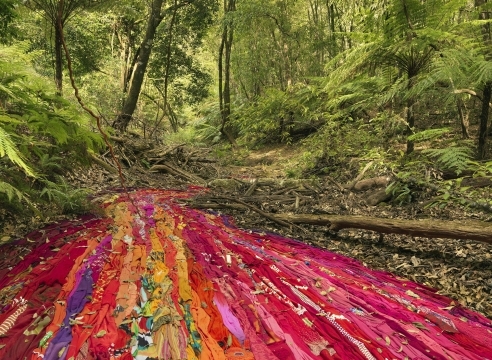 She typically works in series, creating thematic bodies of work that are often based on socio-economic, political, and environmental issues effecting Australia, but can also be related to a broader world context. Previous series include a dozen useless actions for grieving blondes (2009), weather (2006), one dozen unnatural disasters in the Australian landscape (2003), bulletproofglass (2002), groundspeed (2001), and flight research (1999-2000). All of these series are illustrated in Laing’s new monograph, published by Prestel this spring, which also features an essay by art historian Abigail Solomon-Godeau. Galerie Lelong will host a book signing with the artist on September 8th. Numerous museums have featured solo exhibitions of Laing’s work including the Museum of Contemporary Art Australia, Sydney; Kunsthallen Brandts Klædefabrik, Odense, Denmark; Domus Artium 2002, Salamanca, Spain; Frist Center for the Visual Arts, Nashville, USA; and the National Museum of Art, Osaka, Japan. Her work is present in many public collections worldwide including the National Gallery of Australia, Canberra; Museo Nacional Centro de Arte Reina Sofía, Madrid, Spain; North Carolina Museum of Art, Raleigh, USA; Modern Art Museum of Fort Worth, USA; and the 21st Century Museum, Kanazawa, Japan. Laing has participated in several international biennials, including the Adelaide Biennial of Australian Art (2012), the Biennale of Sydney (2008), Venice Biennale (2007), Busan Biennale (2004), and Istanbul Biennial (1995).